Have completed 2 successful brews using 20l BM + SSBrewtech Brew Bucket with 3rd brew on the way. 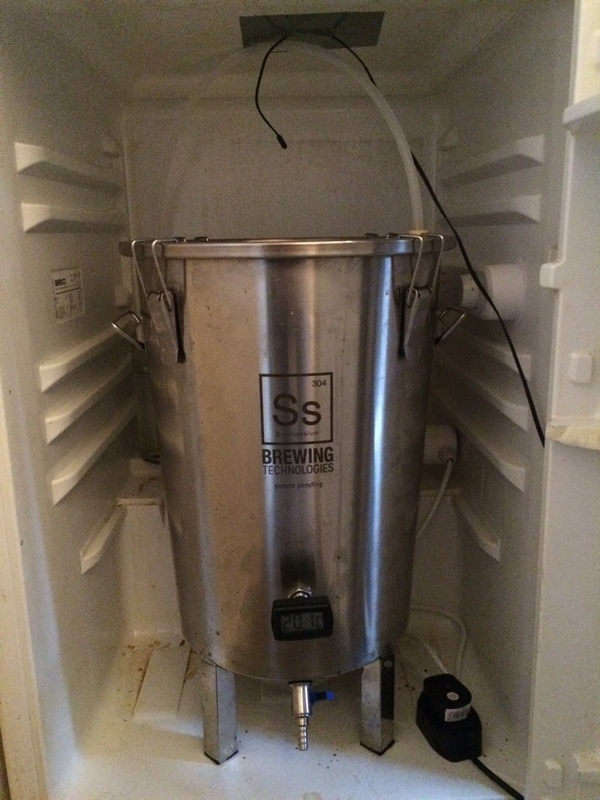 Brew Bucket has been pimped by adding 4" thermowell - see pics. Plan is to add Dallas temperature sensor and display temperature either on local LCD display and/or graphically on a website. No problems with BM so far (includes jacket + hood). Well done Ginger...I emailed Rob (malt miller) about these buckets, I think he has them in stock now. I must admit I'm very tempted...do you use a brew fridge? do they fit inside a standard fridge? I've got a thermowell in the brew house never used it, I bought it for a 100 liter SS pot, it has a dial thermo fitted, the round one. I've not seen a Dallas temperature sensor, how will that work? ...wired or wifi ?? Welcome aboard ginger, I am formerly of Suffolk myself, which part do you hail from? Icefever wrote: Well done Ginger...I emailed Rob (malt miller) about these buckets, I think he has them in stock now. I must admit I'm very tempted...do you use a brew fridge? do they fit inside a standard fridge? Hi Guys - thanks for the interest. Yes - I bought the brew bucket from The Malt Miller the plan was to test it and if it works then get at least one more and then stack them inside a 2nd hand commercial fridge since it will be living in my garage - along with the BM. It turns out that the bucket works really well so I will be buying another one soon and volume-wise it is well suited to the BM. They are quite compact so I expect one will easily fit inside a standard fridge even with an airlock poking out of the top of the bucket. I can do either wired or wireless with the Dallas temperature sensors - I notice that http://www.brewpi.com sells them already wired to a plug and encased and not a bad price at 7€. The picture shows my first prototype monitor/control electronics with an Arduino micro-controller powered by a USB charger at the top, a relay to switch mains power on the left, an up/down switch on the right to change the threshold voltage, an LCD display showing the current temperature and threshold temp and finally the Dallas sensor is at the end of the grey cable waterproofed by some black heat shrink. When the pic was taken I had set the threshold at 23 degrees C and the current temperature is 21.375 hence the red relay LED is lit indicating that heat is being demanded. My initial idea (before I get the fridge) was to cover the brew bucket in a box made from Celotex and control the temperature inside with heat coming from say a 100W lightbulb……For the time being I’ve moved the fermentor inside the house so there is no need to keep it warm (the garage is getting too cold now that summer has ended). To make a wi-fi version I’d use an Electric Imp (http://www.electricimp.com) - I already play around with the IoT and monitor things like my greenhouse temperature so adding a fermentor or two will be straightforwards. The BrewPi site has an interesting section on hacking fridges so that they can be used as both coolers and heaters (by adding a heater) so when I get my commercial fridge I will be adding a heater plus my own temperature control electronics. I live in Kesgrave - to the East of Ipswich. My old man lives in Ipswich, can't be far from you. Is that switch a power window switch from a BMW?